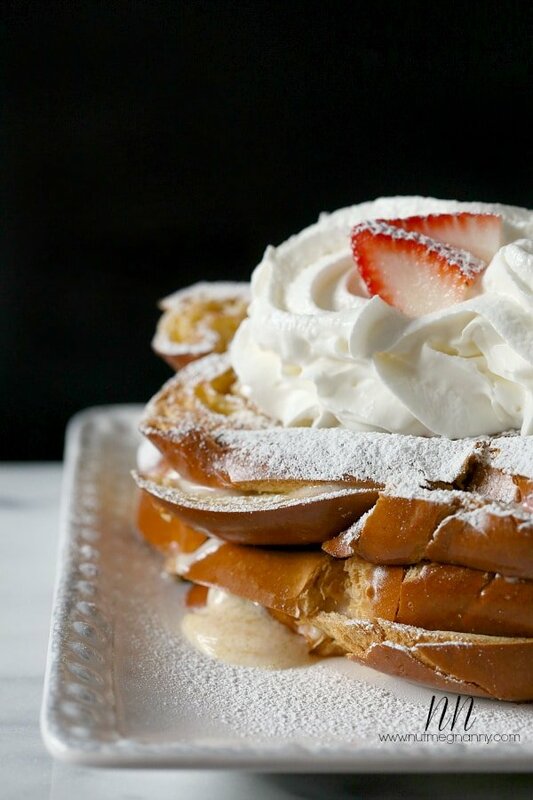 Today, I’m excited to have my friend Brandy from Nutmeg Nanny sharing her recipe for Strawberry Mascarpone Stuffed French Toast. Brandy and I co-hosted Frozen Treat Week together last summer and although we haven’t met in real life (yet) we chat via email and Facebook messages like we’ve known each other forever. Hi everyone! I’m Brandy from the blog Nutmeg Nanny and I’m super excited to be guest posting here on Katie’s Cucina! I wasn’t sure what to bring to the table but I finally opted on breakfast. Breakfast is one of my favorite meals but the one I probably skip the most. I hate getting up in the morning and cooking for myself. I’m one of those “lounge for an hour before doing anything” people. If I won the mega lottery I would totally hire a personal chef. I know that might sound like a weird thing for a food blogger to say but sometimes it’s nice to have a break…am I right? But, since I haven’t yet won the lottery. I’m still in the kitchen trying to muster the energy to figure out breakfast each morning. This totally over the top stuffed French toast is the perfect weekend meal. I used thick sliced challah bread and stuffed it with sweetened mascarpone cheese and fresh-diced strawberries. Let me tell you, strawberries in the middle of the winter make me so happy. In a medium sized mixing bowl stir together mascarpone cheese, powdered sugar, vanilla bean paste and diced strawberries. Lay out challah bread and spread 1 tablespoon butter on one side of each slice of bread. Flip two slices over and spread half of the mascarpone mixture on each slice of bread. Top with other half of bread, butter side up. Add to a large skillet or griddle set over medium heat. Heat until the underside is golden brown, flip and cook the other side till golden brown. Add to a large plate and top with whipped cream and powdered sugar. If your challah loaf is not very wide you can make 4 sandwiches instead of 2. To say I’m looking forward to breakfast now is an understatement. That is one lovely pile of breakfast. Mascarpone and strawberries are just meant for each other. I know Shaina! It’s an amazing recipe. oh my gawd! It’s good to have friends like Brandy! 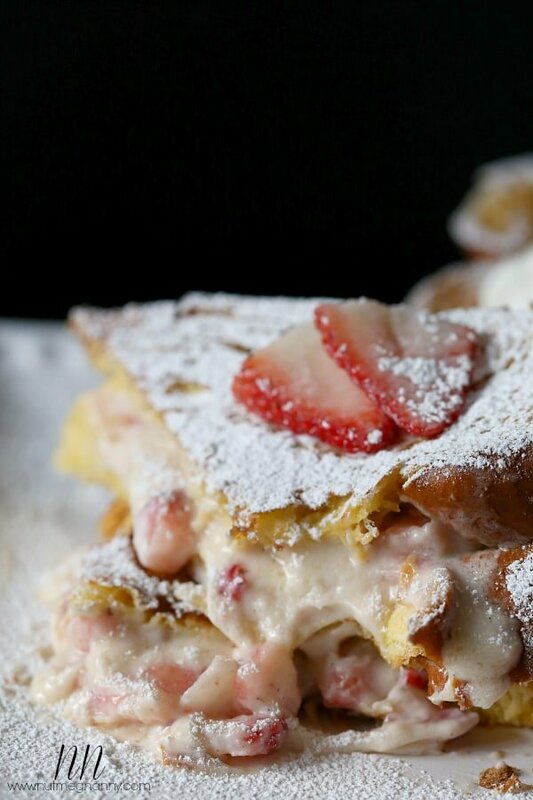 Her Strawberry Mascarpone Stuffed French Toast looks amazing!!! pinned! ha ha thanks Alice! I know it looks amazing! Wow, this looks so decadent!